The South Dakota State Historical Society’s Historic Preservation Office is sponsoring a three-day archaeology camp for students going into grades 4-6 for the 2018-2019 school year. Camp dates are June 5-7, from 8 a.m.-5 p.m. CDT. The program is structured for students to attend all three days. Students will be introduced to the field of archaeology, learning why archaeological excavations are held, what stories artifacts can tell about the past, the history of fur trading posts, how to map a site and how to use team-building skills. In addition to excavations at the site, other activities will include processing artifacts and practicing with atlatls (ancient weapons which preceded the bow and arrow). There will also be trips to the Turtle Effigy and the Oahe Chapel along with tours of the archives and museum of the South Dakota State Historical Society at the Cultural Heritage Center. Due to the popularity of the camp, registrations are limited to the first 20 applicants who have not previously attended. Prior participants may apply, but their names will be added to a lottery and only considered if there are less than 20 new campers. The registration fee is $30, and registration begins at 8 a.m. on May 1. It will close on May 4 or when the camp is full, whichever comes first. No walk-in campers will be accepted on camp days. Registration and payment will be available online only via the website at history.sd.gov/preservation. Click on the red link near the top of the page. 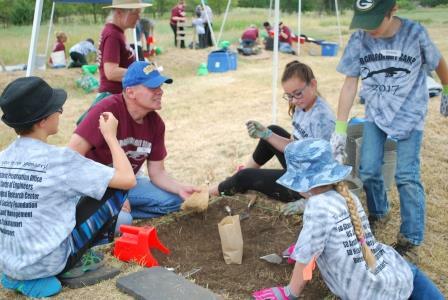 For more information on the archaeology camp, please contact Paige Olson with the historic preservation office at 605-773-6004 or at Paige.Olson@state.sd.us. For more information on other historic preservation programs, contact the State Historic Preservation Office at the Cultural Heritage Center, 900 Governors Drive, Pierre, SD 57501-2217; telephone 605-773-3458, email shpo@state.sd.us or visit history.sd.gov/preservation.